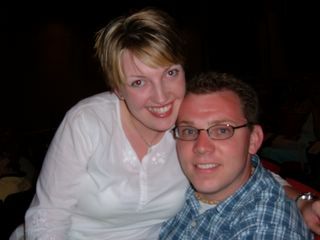 As I mentioned in my very first post, Vic joined Park City Toastmaster's. If you're not familiar with Toastmaster's, you should type it into google and see what happens. If I were more computer savvy, I would have just told you to click "right here" and had a link. But as I am only about 60% or less computer literate, you'll have to settle for closing this window, opening another and doing the search yourself. Anywhooty---I mention Toastmaster's in order to explain why I am standing next to a 7 ft. 4 man in the photo below. Mark Eaton, ladies and gentleman. A former NBA star and my identical twin. I'm tired of people asking me if we're related. Just because we're the same size doesn't mean anything. GOSH! So he is a member of said organization and hosted a party at his home. What an impressive group of people and what a neat organization. As I'm sure you've read by now, from your google search, Toastmaster's helps people with public speaking, communication skills, and leadership skills. I was called on to make an impromptu speech (they call them Table Topics) and was nervous out of my mind, but stepped up to the plate and pulled something out of my buttocks that seemed to work ok. Here was my topic: "If you ______, than you will _____. " What would you have filled in the blanks with and talked about for 2-3 minutes? If you leave a comment and answer this question, I'll let you know what I came up with. 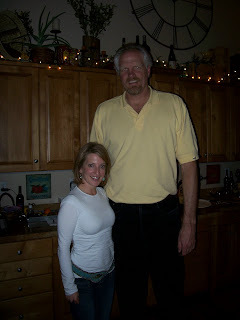 Also, if you would like to learn more about Mark Eaton, you can go to his website: 7ft4com. "It's so nice to finally meet someone my same size." Said Molly while shaking the giant hand. He looked down at her with an expression that said, "Listen, squirt. Don't try to be witty with me. I've heard them all before." It was a nice try. But shall never be attempted again. --True story. If I were funny, my blog would be as entertaining as yours.